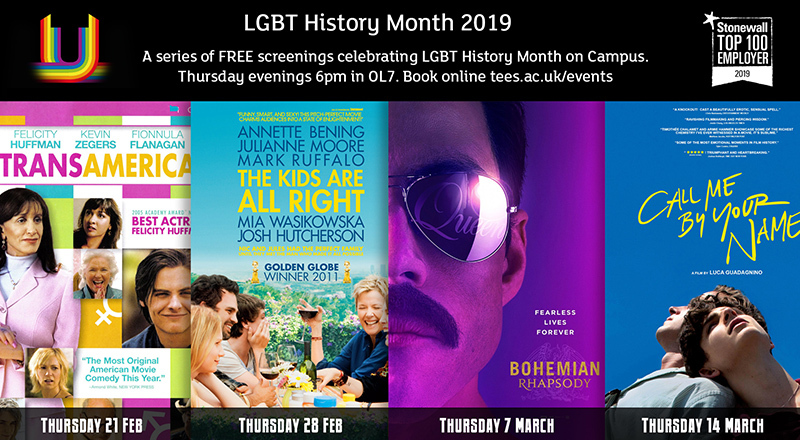 Transamerica, The Kids are Alright, Bohemian Rhapsody and Call Me By Your Name will be shown on Thursday evenings, at 6.00pm in the University’s Europa building. Teesside University was this year named as one of the country's top 50 employers for LGBT+ staff. The University’s commitment to equality was commended by Stonewall, the lesbian, gay, bi and trans equality charity which annually publishes its list of the country’s top 100 workplaces. Teesside University was placed at 47 in the Stonewall Workplace Equality Index 2019, a rise of 20 places from the University’s position in 2018. It is the fourth consecutive year that Teesside University has been included in the top 100 list of employers, recognised for their outstanding efforts to create an inclusive workplace for their lesbian, gay, bi and trans employees. Teesside University is one of just five universities in England and the only university in the North East to be featured in the top 50 in the Stonewall Workplace Equality Index 2019.